My sister JoAnn is the most amazingly talented baker/chef/hostess I know, so I had to up the ante when her birthday came around. After a tasty breakfast up in Placerville, the plan was to head to Apple Hill for some awesome apple treats. The trip to Apple Hill was the inspiration for these bite size treats. 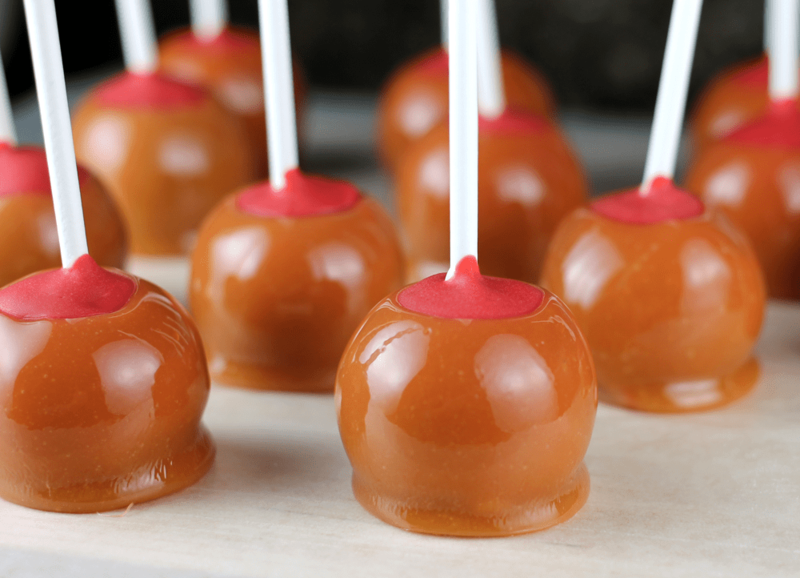 My train of thought went something like: Apple Hill… apples… caramel apples… mini caramel apples… caramel apple cake pops! Chocolate is always a crowd favorite so I used chocolate cake and chocolate frosting for the cake balls. I imagine some spice cake would be super delish too. 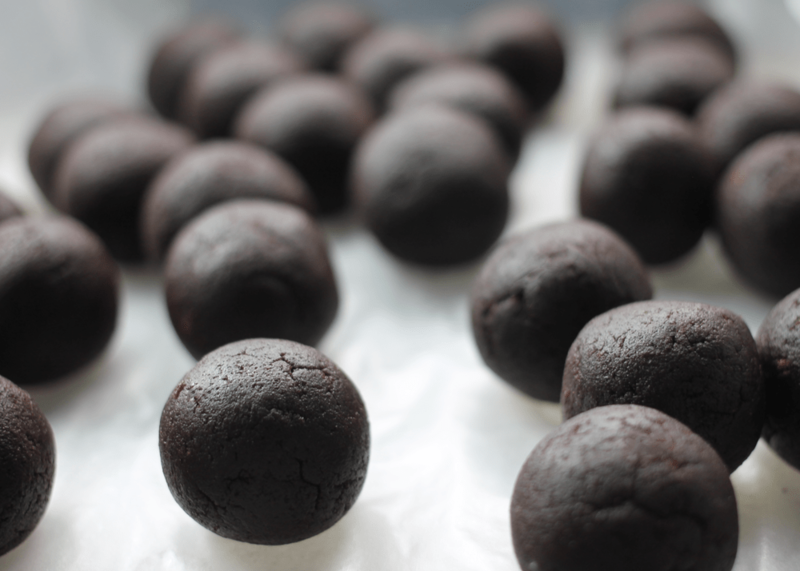 I chilled the chocolate cake balls in the fridge overnight, but a few hours would be sufficient. You just want the balls chilled enough to hold their shape a little better when you dip them in candy coating. Before the dipping in candy coating, you’ll want to add the lollipop sticks. 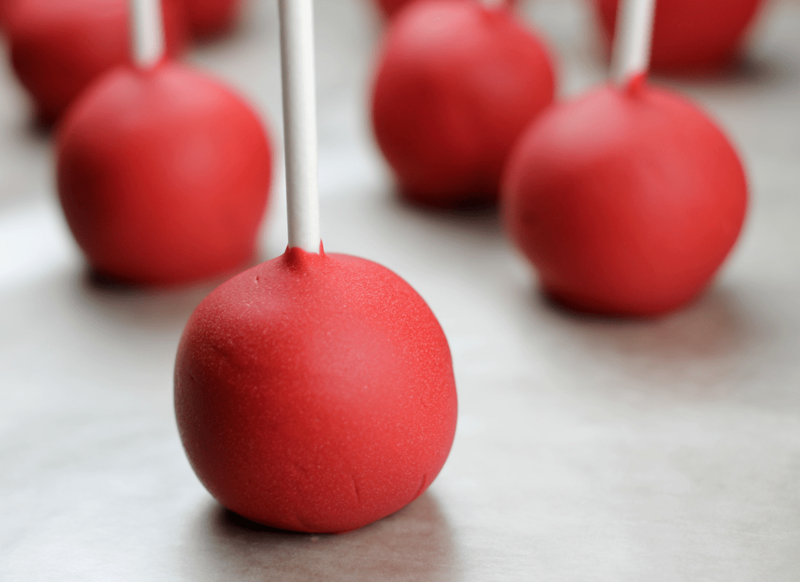 To help the lollipop sticks stay in place, I dipped the ends into some melted chocolate before pressing them into the cake balls. I removed the excess chocolate from the top so there wouldn’t be a mini white chocolate mound on top. I put the cake balls back into the fridge for another 10-15 minutes to make sure the white chocolate was set. While those were setting I melted some red candy melts. Dipping cake balls into chocolate is never an easy task for me. What’s great about these is the chocolate coating doesn’t have to be perfect! Why? Because they get dipped in caramel after this anyway. The cake ball below is the most perfect one I’ve ever done so I had to show it off. Believe me, it is a rarity in my kitchen. I used almost an entire bag of caramel candy and prepared it as you might for real caramel apples. 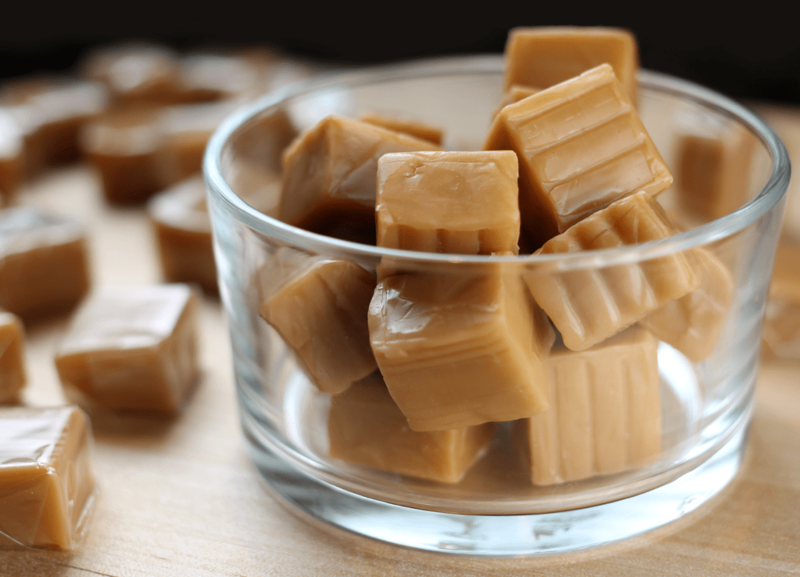 This means melting the caramel candy along with two tablespoons of water to give it a thinner consistency for coating. While dipping the cake pops, what helped me was keeping the caramel very hot and thin for dipping. I quickly dipped the cake pops and let the excess caramel drip off the cake pop as much as possible. Even a little bit of caramel is going to pool at the bottom (and that’s ok), but you want to keep it to a minimum. The first couple I dipped ended up with about a 5-inch caramel puddle. No joke. Place the pops onto wax paper while they set up. I put the caramel-dipped cake pops into the fridge for a little over an hour so the caramel would harden. AND THEN I thought I ought to drizzle some chocolate over some of the cake pops! 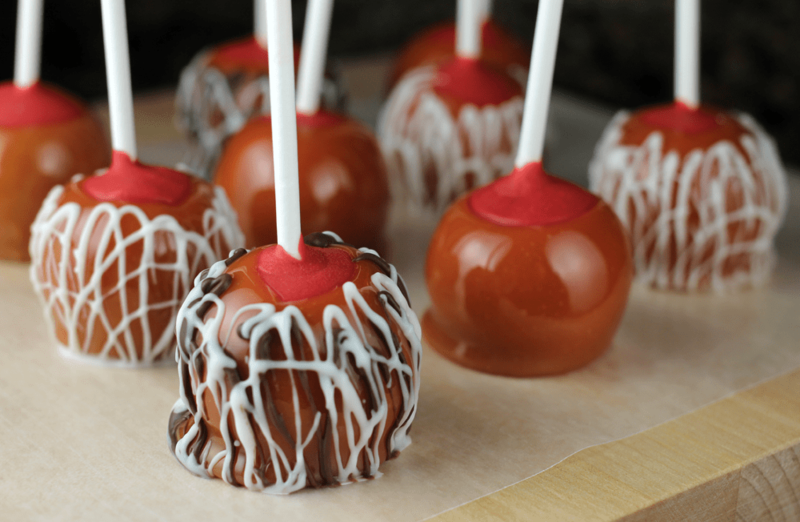 The chocolate drizzle made the pops look even more like caramel apples, don’t you think? Another benefit of a candy drizzle is it adds a non-sticky layer over the very sticky caramel. 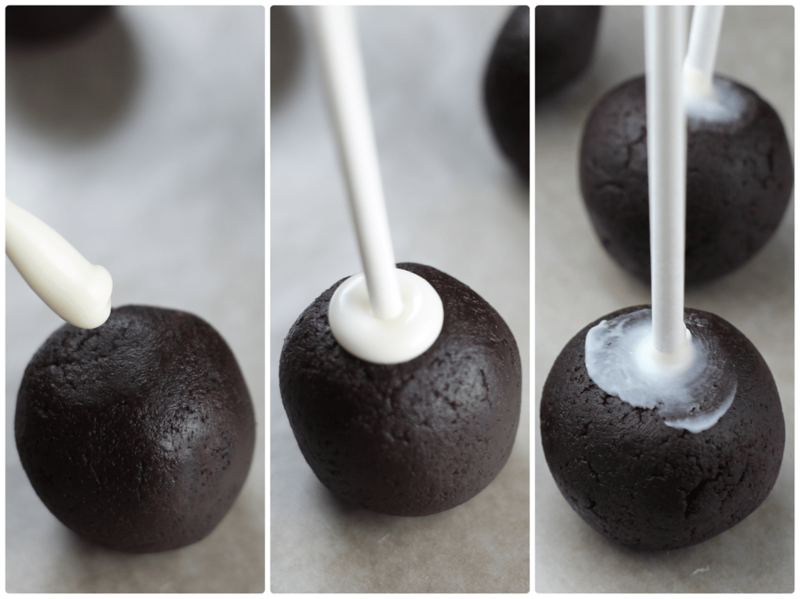 If you need to package or transport these cake pops, as I did, the chocolate makes it a lot easier. My sister said they were amazing! The next day my sister Vicky (another great baker!) made REAL caramel apples and brought some some over. It was a very apple-filled weekend for all and I can’t wait to do it again.